One of the Elasticsearch clusters I’ve worked on is spanned across multiple data-centers around the world and stores some very large indexes. Sometimes, but not often we have the need to get a backup of one of these indexes off of the cluster for restoration onto another cluster, but due to the sheer size of these indexes, its not practical for us to snapshot it to S3 or even a shared NFS mount (as the cluster spans multiple data-centers). Therefore the local file-system “fs” snapshot type is the only one really usable for us in this scenario.. but what you end up with is parts of the snapshot distributed across individual nodes all over the world. So there was a need for a tool to automate the task of collecting all of the individual snapshot “parts” and downloading them to a central machine. 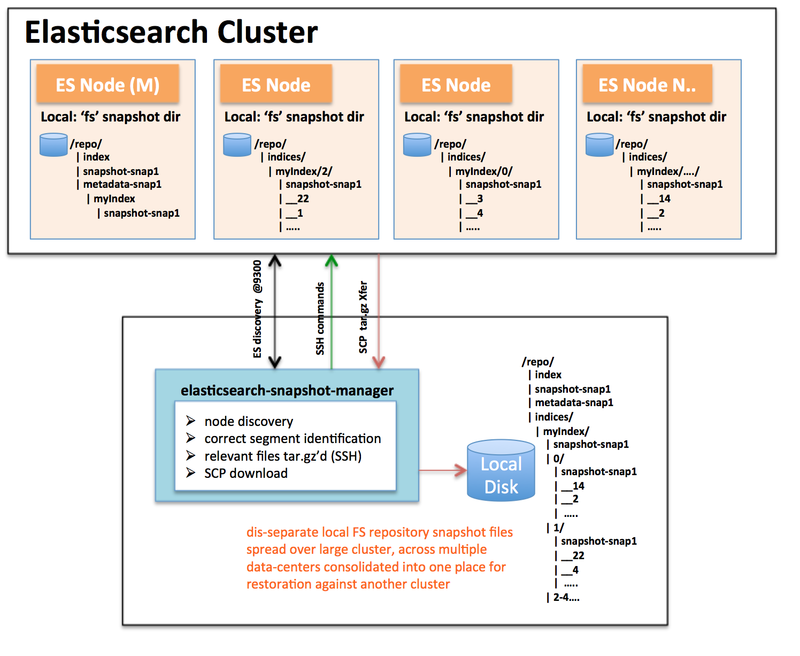 If you’ve ever looked into the actual format of an elasticsearch snapshot its a little tedious… i.e. you just can’t blindly copy over the contents of snapshot shard directory contents as ES smartly does snapshots via diffs and keeping track of what files are relevant for each snapshot in metadata files; see here for an excellent overview: https://www.found.no/foundation/elasticsearch-snapshot-and-restore/. So in the end I came up with elasticsearch-snapshot-manager (Scala) as a tool for handling all of this (analyzing, aggregating, downloading). You have a “shared filesystem snapshot repository” who’s physical location is local to each node and actually NOT on a “shared device” or logical mountpoint (i.e due to (1) above), the snapshots reside on local-disk only. Please see the github project for all the details @ https://github.com/bitsofinfo/elasticsearch-snapshot-manager , feedback appreciated.